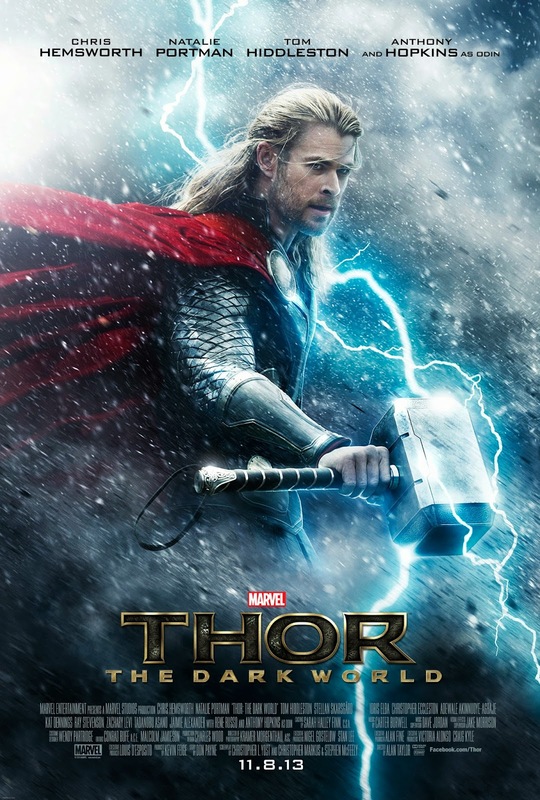 The latest Marvel film to roll off the assembly line is THOR: THE DARK WORLD, and once again it delivers a smart, funny, action-packed piece of superhero cinema. Taking place in the aftermath of 2012's superhero team-up THE AVENGERS, that film's villain Loki (Tom Hiddleston), who also happens to be the adoptive brother of Thor (Chris Hemsworth), about to receive his punishment back home in the other dimensional realm of Asgard. Only the love of stepmother Frigga (Rene Russo) saves the power hungry trickster from the death penalty, his step father Odin (Anthony Hopkins) instead sentencing him to life in prison. But when a menace from Asgard's distant past is unearthed by scientist (and Thor's girlfriend) Jane Foster (Natalie Portman), Loki is the only one who can help Thor combat it. Thor as a character really doesn't have much depth; he's basically just a good natured if arrogant frat boy who likes to party and get into a good brawl now and then. Put him in an unlikely partnership with his treacherous half brother Loki, though, and the latter's sarcastic wit plays off against the former's dim but earnest heroic bluster to good comic effect that provides THOR: THE DARK WORLD with it's best moments. With Loki taking more of an anti-hero role this time out, the film needs a good “big bad” to replace him with, and former Dr. Who Christopher Eccleston is more than up to the task as Malekith, leader of the dark elves who wants what Jane has found. The romance between Thor and Jane doesn't get much play, but on the plus side Portman's character gets more to do here than just be the hero's girlfriend waiting to be rescued. Also returning from the first Thor film are Jane's fellow researcher Dr. Selvig (Stellan Skarsgård) and her intern Darcy (Kat Dennings). Rounding out the cast of characters are more “not really gods, just really long-lived and powerful extra-dimensional beings who were once worshiped as such” Asgardians than you can shake a hammer at, notably the returning Idris Elba as Heimdall and Jaime Alexander as Sif. Overall it's a hugely entertaining film if you like the superhero genre. I know there are plenty who don't, including at least some of the fine writers on this blog, and there is absolutely nothing in this movie that is likely to win them over. Personally I like these kind of movies as long as they're done well, and for the most part that's the case with THOR: THE DARK WORLD. There may not be much in the way of subtext or deeper themes, but it still has some wit and intelligence in the dialogue department and spends enough time developing its characters so as to balance out the rousing, effects heavy action sequences. About the only complaint I would make is there's probably a bit too much comic relief, with the strange (and unexplained) turn towards the eccentric taken by Skarsgård's Selving being particularly grating. Still, it's not enough to dampen my enthusiasm for an otherwise satisfying popcorn movie. 3 out of 4 stars.